No, dear. How about new Blood lines? That sounds much less Zombie Queen or Vampire Princess. Let’s go with that. 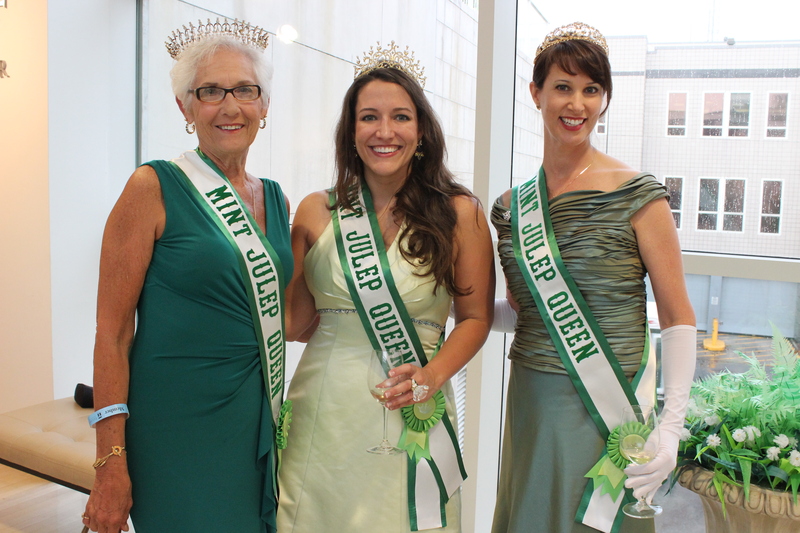 New Bloodlines have been formally welcomed as the newest members of the Mint Julep Queens. Queen Janet, Suzanne, and Cara (after ages of being notably charming) and after spending a bit of time with our group, decided they like us. They enjoy our company and we enjoy theirs. 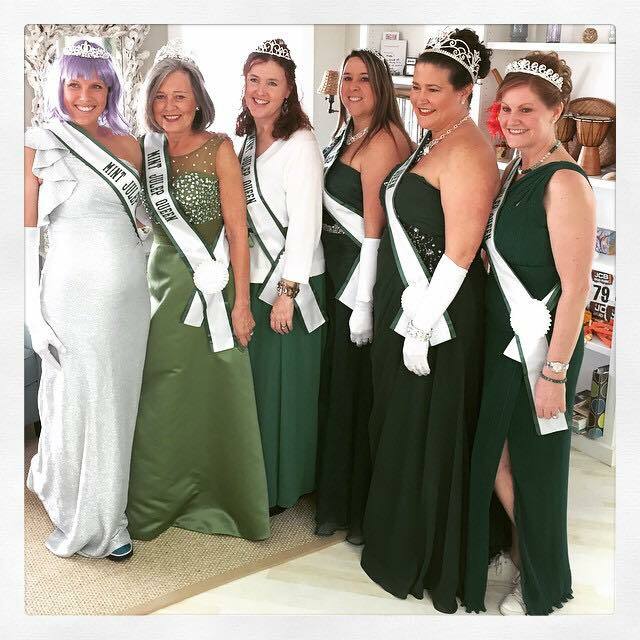 After attending several parties with their sponsor, we invited the three Ladies in Waiting to become crown-wearing, scepter-toting monarchs who absolutely refuse to give up the exciting aspect of girlhood— the ultimate dress-up. Let’s play Queen! (Playing Princess is really good training for playing Queen, is it not?) Each is Brave, Wise, Charming, Witty, and on Thursday evening, they got Sashed. You wrang your hands and sniveled and wailed, too. The melodrama is unnessacry. The voiceinmyhead exaggerates. And in fact, it was necessary to explain the dire straights the organization was facing. Either we give up and just remain a small band of a dozen ladies like Robin Hood’s Merry Men (and I do not want to be Little John or Friar Tuck, nor wear tights) or we disband like a bunch of losers. The choice of growth and expansion was the most unlikely option, however it was the only option I wanted. Kim and Sylvia headed the squad of cheering and planning. 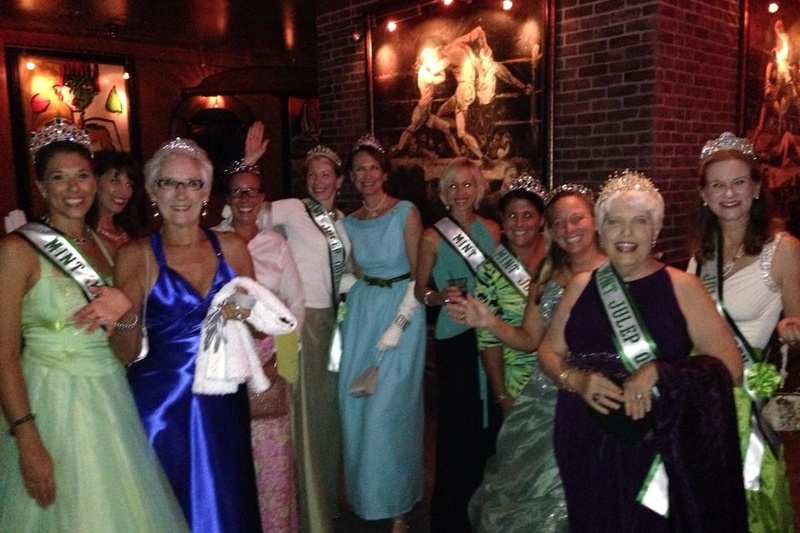 Their Ladies in Waiting were first in line for our Tenth Anniversary Coronation and Flounce. With over twenty females braving the storm, we rocked the Jepson Center. With help from new generations of exceptional fun-loving ladies with girlish hearts, we decided to blossom. We rise from the ashes like glittery power phoenixes. I believe our mission is unstoppable. And what, pray tell is your “mission”? Don’t play dumb with me, voiceinmyhead. You know exactly what the mission is. Give yourself permission to have fun and stop for one instant worrying about being judged. Give yourself permission to Prance and Dance with abandon and joy. Give yourself permission to seek out the camera and say, “Hey, you! Take MY picture! I am here.” Give yourself permission to laugh really loudly and giggle non-stop for longer that most well-mannered belles ever thought they could. Give yourself permission to be grateful that you have eccentricities that turn out to be your gifts and you need to magnify them, not hide them. Give yourself permission to no longer be the judge and jury of others and most of all, of yourself. Fun is fun and if it ain’t fun, honey, don’t do it. Being Royal does not hurt a single soul, my dear little crowder pea. What hurts is wanting desperately to wear a tiara and never, ever gathering the gumption to do it. 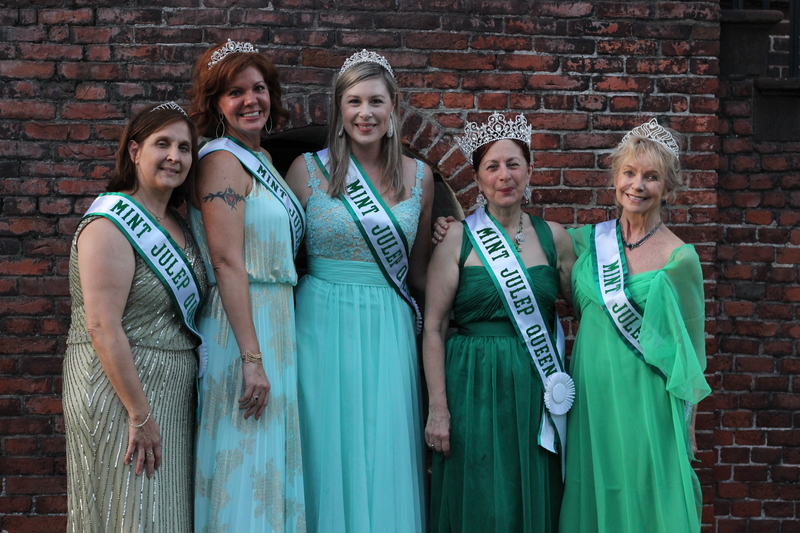 Ten years ago when the Mint Julep Queens were created by five fun loving women, we thought each lady would have such a strong sense of self, that each queen would create their own unquie version of sovereign. If you have never contemplated ruling a realm, you clearly are not a Royal yourself and must be studying the phenomenon. Let me explain the facts and images a monarch may channel when she is invited to attend a Flounce with us. American Queen Jackie Kennedy is the epitome of American Queen in Camelot, complete with clean and crisp lines cut from the pages of the early 1960’s. This Queen is Elegant, Understated, but Powerful in her confidence and ease. She may be soft spoken, but she is brilliant, charismatic, and iconic. Something about those long white gloves makes the crowd wave at her. She waves back and nobs with a demure smile. This queen is diplomatic. International. Globally astute. Prom Queen. The lady would have been the perfect homecoming chick– if only she had been popular . She was not selected by her classmates because she was not a follower and sashayed to the beat of her own our beach music. (Honestly, she was not very pretty either. She may have suffered from UDS– Ugly Duckling Syndrome.) But she always wanted a big dress the size of a homecoming float. Toile and ruffles, chiffon and sequins decorate bright green. Her laughter is infectious. She is Very Smart and tries every day to be Kind. Just because she was not voted the most popular cheerleader– (she was not ever a cheerleader, by the way)…just because she was a total nerd in school, does not mean she disdains rhinestone crowns. On the contrary. Pageant Queen. We have some members who really were so pretty in their youth that they were crowned Queens in beauty contests. They have maintained a beauty that is amazing. These ladies are humble and know genetics gave them the physical beauty they possess, but their character is their real gift. 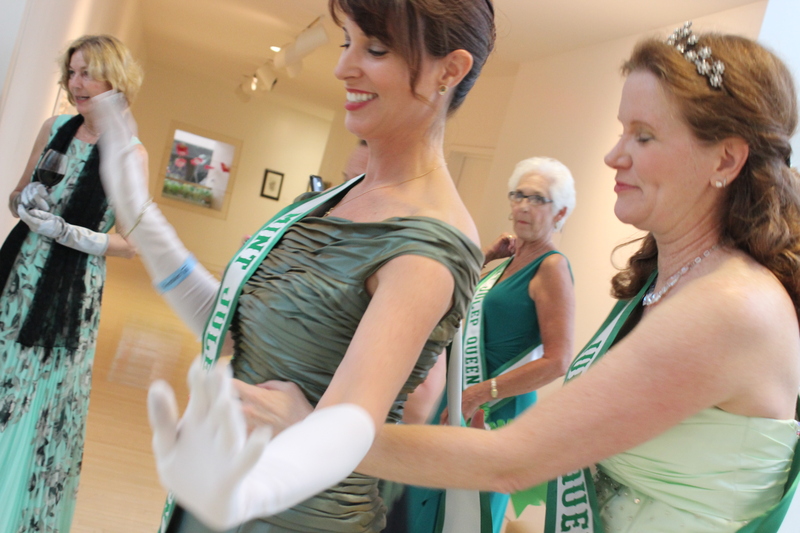 Good humored, cheerful and out- going, Pageant Queens are informed, sentimental, and polite. (The Pageant Queens the MJQs hang out with are these things.) They still own their crown and love the chance to wear it again. Pageant Queens are informed from the era that they reigned. Fashion Queen. A 1950’s silhouette. A Chanel look. Dior. A Marc Jacobs gown. An Oscar dress. This queen loves the spotlight, (who of us doesn’t?) But is happier to share the attention with fellow Royals. Metropolitan and Urban, she is intelligent and witty. Attention to details describe her. Every photo of her is perfect. Character Queen Inspired by history or literature, this Queen has a deep sense of Myth. Represented archtypes and all, she is acutely aware of her impact on the commoners. Energetic and strong she is enchanting. Elizabeth I. Victoria. Gwinevere. Catherine the Great, Cleopatra. Mid-Summer Night’s Dreame Fairy Queen. Cinderella. Sleeping Beauty. Scarlett O’Hara. Need I say more? Thrift Shoppe Queen The lady’s look will change based on her mood and her pocket book. Her thrift shop finds will inspire attire. She would rather invest her treasure in family and causes than the fleeting fabrics of a grown. Hyper-creative, she laughs easily and with deep gusto. She attracts attention and admiration wherever she flounces. She owns more than one MJQ gown. Campy Queen She is glittery and bright. Flashing lights may suddenly appear around her. She will stick battery powered lights to her dress or shoes. Comfort is more important than anything., so she will wear cowboy boots under her crinoline. Good natured and cheerful, she is the life of the party. She knows no fear. The list above is just the short list. Some of the MJQs change their style from year to year. Some MJQs have specific emergency needs that arise on the day of an event that impact dress choice. ( Like your darn zipper broke; you are in mourning and totally must wear somber colors; or your dress shrank in the closet.) It is your realm so you decide what works for you. And it always a Queen’s prerogative to change style. We do not all dress alike– except for general hue…green, greenish blue, blueish green, grey green, greenish grey and silver. Got it? Emergency attire of unlimited hue is of course encouraged. Group photos look so much better when done in same the tonal range. N’est pas? But really, as long as you are happy, it will be the perfect dress for you. If you are not satisfied with your Royal Style, change it. Remember honeys, you are not a tree, rooted to one spot. You can move. You can Flounce. With the Queens, and in life, it is wise to adopt a look that helps you enjoy your journey. As you sashay your chosen path, folks around you may break into applause. If they do not, they may not recognize you. Never the less, it is still good to be Queen. Queen Kim’s Birthday and How do I bottle enthusiasm? I have two big project in the works. No! That is more like three big projects in the works. One. I am doing right by myself and the others I have asked Kim and Lee Ann to assist. They are going to drive the Royal Carriage and get the thing moving. OH dear me! I can understand how you became mildly confused. Allow me to explain. Not every Queen likes bourbon. 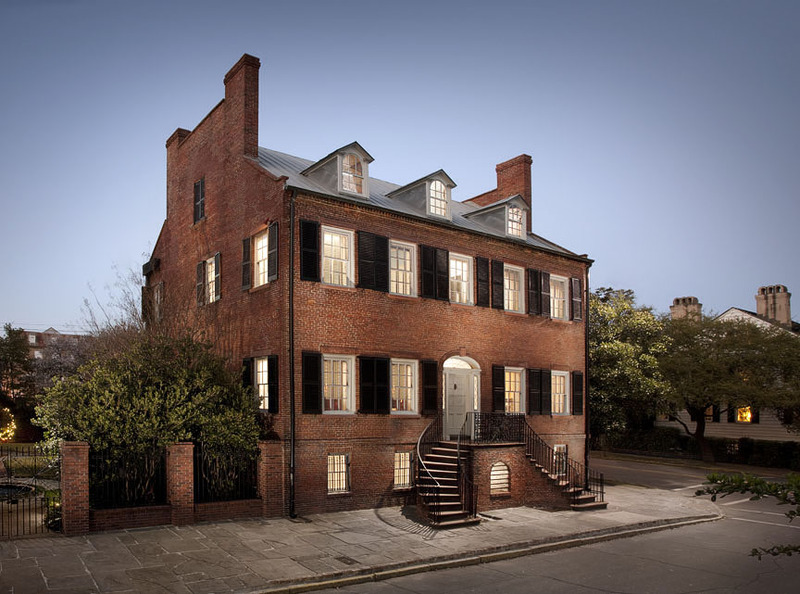 I know it is beyond imagination since The Julep is the epic, iconic Southern Cocktail and WE as a group are the finest example of fabulous flouncing females in Savannah, who it seems would love a nice Marker’s Mark toddy. BUT we need a cocktail that every barkeep can mix and not screw up. There are very few good juleps to be had in Savannah. The one at Elizabeth’s is the nicest. The Rocks on the roof at Avia can be good, if the right barkeep is working and to my knowledge the one at the Pink House is ok. But since mint is vital, a capable barkeep a necessity, and a love a bourbon a prerequisite, we need a drink all the MJQs will love. 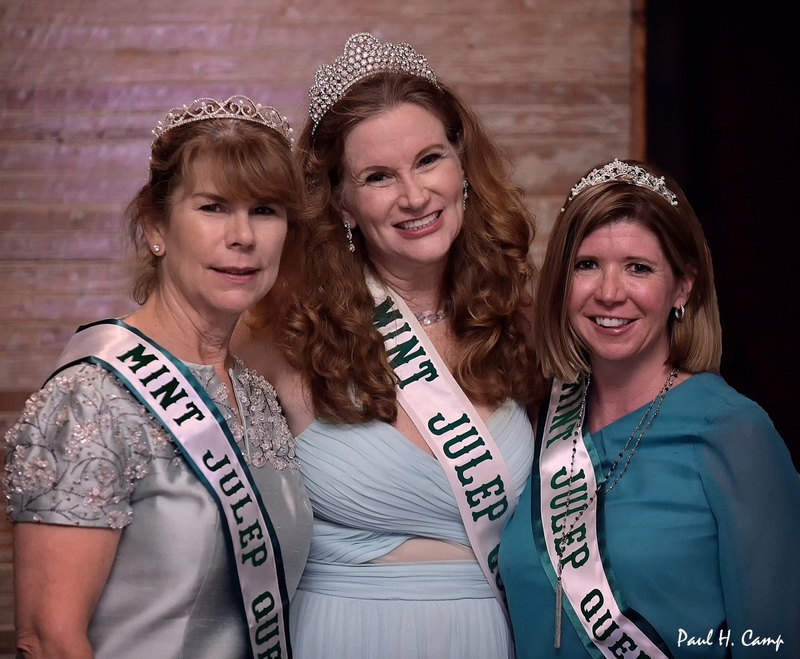 I suggest the Name: A Mint Julep Queen. Maybe by Leap year we will have that completed. Next. Queen Kim, who just had a birthday TODAY. (And no dear, I am not telling her age. That is not wise nor it is Queenly of you to even ask. ) Our Queen Kim and I are looking at developing a relationship…maybe relationship is too familiar…an association with SCAD so their Costume Department and their other brilliant young students might benefit from our Royal Glory and we benefit from their artist talents. It is a win-win, n’est pas? (That is French for: ”Isn’t that so?” Or in the case of a deep South translation “Ain’t dat rite?”) So honeys, It IS a win-win! Ain’t dat rite? I am working on the MJQ Calendar Project and Membership Directory and writing and blogging. Hopefully all this is will make the world a more fun place and give someone…anyone…a reason to don a rhinestone tiara and go forth into the world to spread joy and charm and sparkles. No matter your hardship, celebration of your own Royal nature is a valuable endeavor, ain’t dat rite? Queen Tricia had a baby boy last week. Yes. I know has it been that long? 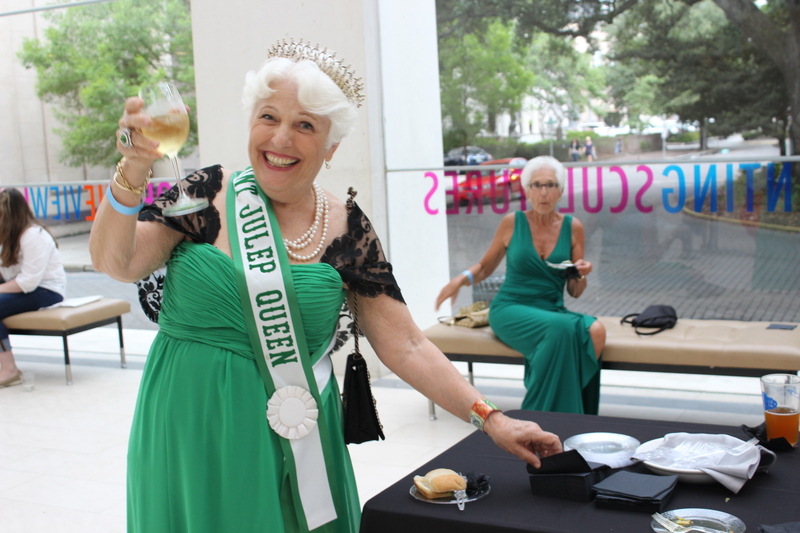 I saw her at Harvest Moon at Mary’s home 2 years ago in October and that was the last Mint Julep Queen event she has been able to attend! Poor, busy, hardworking Queen. Maybe next year she will be able to schedule a photo shoot for the Membership Directory and we can get her Mum, Emeritas Queen and Royal sustainer, Queen Cathy to have a photo done at the same time. The boy was born 5 pound 9 ounces. I hope all is well in that realm. If you hate putting on an outlandish green ball gown, you may be in luck. You may get a chance to have something designed just for you! Or you may get help with ideas, solutions and shopping suggestions from some talented young students. It is still a big MAYBE, but we are working on it. I personally adore outlandish, show stopping regal, elegant, retro 50’s, and new re-worked 60’s. I covet 1920’s fapper and wish I owned a Green Channel. I happen to lovelovelove trying on and wearing all sorts of cloths!! It is like assuming a part in a play. Sometimes I wear my neon green chiffon with the Disney-esque skirt and I even add a crinoline. I know. You may ask, ”How big can that dress get really get without it exploding?” But I like a swishy skirt, so relax and stand a respectful distance from me, if you are worried. Sometimes I wear the Cate Lyon raw silk; I can not afford James Hogan, yet. (Remember. I got the Cate Lyon on sale.) It is the one with the hot pink bra showing and the Sponge Bob like flowers in white silk. When I wear that dress, I should always wear my hair up so, that one has its limitations. I used to have a retro 50’s style cocktail length multi colored dress. It was precious. The color of sherbert. Lime, Orange pineapple. I paid 30 bucks for it and all it need was an added bit of green chiffon shirting. The darn lady who was altering it stole from me. OK. she did not actually steal it, in that it was her intent. I drove by her shop one day and it was out of business, closed up tight. The owner of the building claimed not to know how to get in touch with her. Of course MY dress was with her, being held hostage, I can only assume. Poor littlecutedress will never again know the joy of being worn by me. Poor, Poor littlecutedress! So I want…I do not need. I want new regalia. ”But Erica,” I hear you saying. “What happened to that one you got at Frills and Fancies about 2 years ago? You have never worn that one!” Ok. You are right. I bought a Las Vegas looking green silk with plunging neckline, jewel encrusted bodice and no wiggle room for boo. I am not sure it truly expresses who MY INNER queen is or wants to be. IF we every have a casino night, I have the proper Regalia for THAT event hanging in my closet. Even then, is that who Queen Erica really is? Uhmmmm? I just do not know. I have requested assistance form 3 Very Important Queens, Linda E, Jennifer A and Kim A. Kim is already researching how to best approach (and do a Royal Pitch) Micheal Fink, Department Head, David Goodrowe, associate dean, Carmela Spinelli, department chair, or Sarah Collins, associate chair. Since my Daddy was an academic for several years at GSU, I heard all sorts of cra-zee stories about department meeting and the politics of the faculty. Of course, that was my Daddy who has his bigg issues an it was in the English department and not Fashion, So maybe these people run a tighter ship. Or at least a better dressed one. I had a few FUN queens really not be able to attend. One darling queen with attitude will be Chicago. My heart goes out to her. Another is in NYC. Another still is recovering from a tad bit of restorative surgery that will only make her more radiant. I know it is a Holiday weekend, but when I can place odds and make book, or whatever it is gamblers do…to predict who will NOT come, and I am right…well then, YOU may be a “problem Queen”. Think problem child if you are unsure about this. One Lady in Waiting has out of town company and even took the time to jot a sweet note of thanks and a request not to be forgotten and included in the next big party. Well, Honey Queens, anyone who writes a note AND addresses it H.R.H. is just exceptional in every way. So, onto the pitiful members who never dress in regalia in public. Fear of looking silly as measured by their disdain for chiffon, rhinestones, feathers or any other Super Queen garb that would call attention to themselves is the culprit. Raw little girl fear. The kind of fear we had when we were in 7th grade and worried about what the cool girls said about us when we walked by the popular girls lunchroom table. Fear that the boys might think we are not date-able because we are a tad silly. Fear that dancing like no one is watching really sets you apart and makes boys NOT want to ask you to dance. You are currently browsing the archives for the Queens, Consorts, Ladies, and FOQs category.